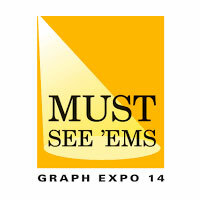 Reston, VA – The 2014 MUST SEE ‘EMS winners have been selected and will be on exhibit at GRAPH EXPO 14 and the co-located CPP EXPO show, comingSeptember 28 – October 1, 2014 to Chicago’s McCormick Place. Chosen by a panel of industry experts, these innovative technologies represent the most compelling advances in 11 categories spanning the entire graphic communications industry. In addition, “Best of Category” winners for each of the 11 categories will be revealed during the pre-show EXECUTIVE OUTLOOK conference, which takes place on its new day and time, Sunday, September 28, 2014, from 8 am to 12:00 noon, immediately prior to the noon opening of the exhibition. Also to be announced at EXECUTIVE OUTLOOK will be the Legacy Award, which is given to a previous MUST SEE ‘EMS winner that has had a lasting and profound impact on the graphic communications industry. GRAPH EXPO 14 also will offer a special MUST SEE ‘EMS pre-show webinar, “New Technologies from the GRAPH EXPO 14 MUST SEE ‘EMS,” presented by the Graphic Arts Show Company (GASC) via www.myprintresource.com and featuring host Hal Hinderliter, coordinator for the MUST SEE ‘EMS program. The free live webinar that will be aired on Tuesday, September 9, 2014 at 1:00 PM EDT will highlight the MUST SEE ‘EMS winners and their new innovations which could impact business and possibly revolutionize market segments. GRAPH EXPO 14 attendees can plan their travel and explore this year’s most innovative exhibition of the latest technologies, unique new applications and profit-boosting opportunities to be found among this year’s MUST SEE ‘EMS winners. Two additional winners in this category currently under NDA will be announced at a future date. One additional winner in this category currently under NDA will be announced at a future date. For more information about GRAPH EXPO 14 MUST SEE ‘EMS, or to register for the show, visit: www.graphexpo.com.